“Despite efforts in many states to bolster science education, a key national test shows no improvement.” This recent statement in the Wall Street Journal stresses the continuing need for quality science materials for schoolrooms and homes. 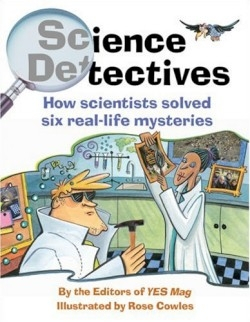 The authors address that need with this book, which latches on to the current popularity of the CSI (crime scene investigator) television shows, and explores the science that is used all over the world to determine the whys and hows of various scientific findings. The authors also edit YES, a Canadian magazine “for Adventurous Minds” ages nine to twelve, and have previously written Fantastic Feats and Failures and The Amazing International Space Station. In one story in this new volume, hikers found the body of a man high up in the Alps. Everything found with him, such as a metal axe, indicated that he was not recently deceased, so he was taken to local archaeologists to study. The book explains how the archaeologists used technology to understand the past experiences of this man to end up where he did, and how he was preserved by the natural environment. At the chapter’s end is a project that readers can do to learn more about archaeology using objects around the home, like making their own buried “fossils” and then “thawing” them and describing how they look. This gives readers an idea of how the environment impacts both living things and inanimate objects, such as paper clips, over time. The authors give a realistic view of the work that is actually is done in the case of accidents, or in determining an outbreak of a deadly disease. Readers learn that it is often not fast work, but rather determined investigations that unravel puzzles and save lives. In one case, in the early twentieth century, families started dying, and the killer was their food! A doctor who was an epidemiologist worked on determining where disease came from, and was eventually able to pinpoint one person. The illustrations are lively and cartoonish; the illustrator has provided art for more than eighteen books, many of them with science themes, including the Mysterious You series. In sidebars, the authors talk about other cases, like the modern-day puzzle solvers trying to understand how the avian bird) flu is spread, hoping to find either a cure or a vaccine, and a monk who made breakthroughs in genetics by studying pea plants.